Happy Easter everyone! 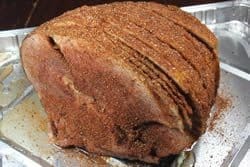 I've had lots of questions about spiral sliced ham over the last few days and to help you out, I've come up with an awesome and tasty way to do spiral sliced ham in the smoker. 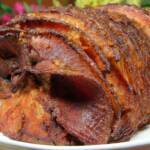 To take double smoked ham to a whole new level of amazing, we used a spiral sliced ham. 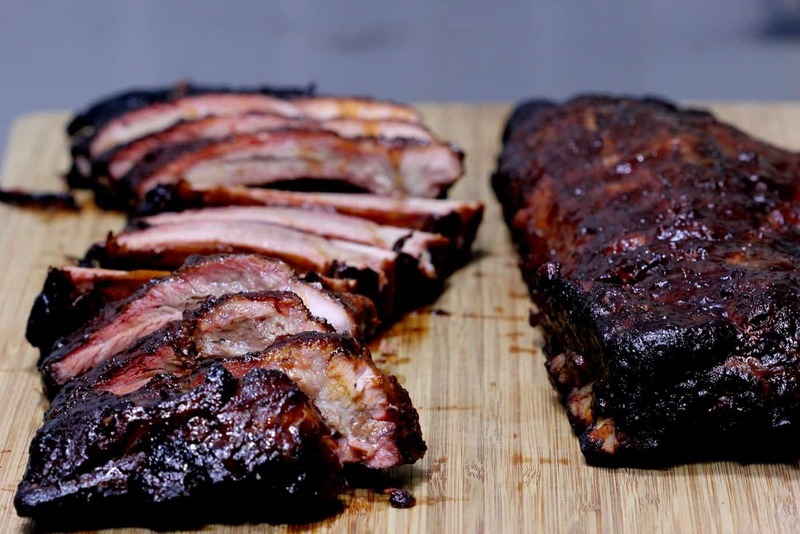 Each slice was pulled back carefully and honey was drizzled generously along with a good dusting of my original rub (purchase recipes here). This may be the best ham I've ever eaten and that's saying something! Ham and my original rub just go together and there's no sense in trying to deny it. 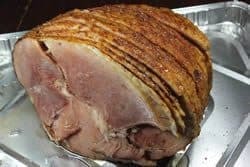 I used my original rub + honey between each slice of this ham to create a ham that goes where I never dreamed a ham could ever go. 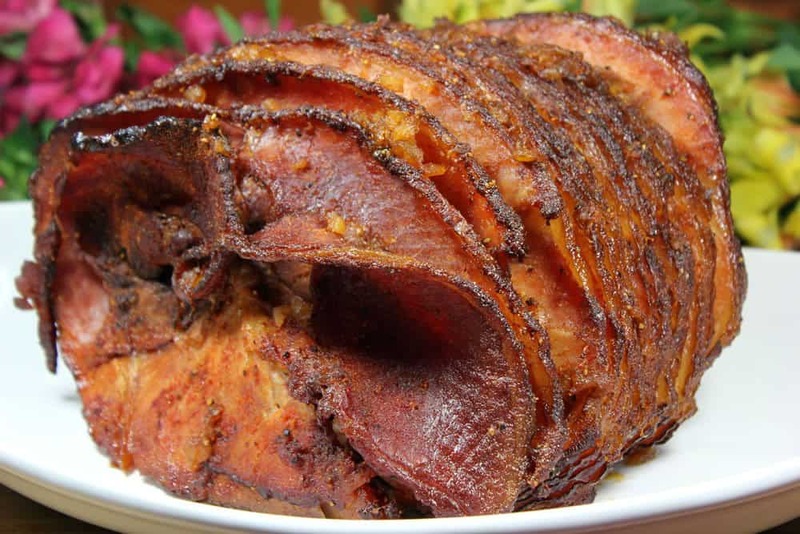 Get ready for your guests to go nuts over this ham! 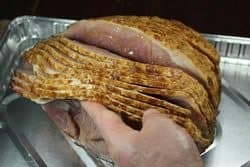 Remove all of the netting and wrapping from the ham and lay the ham on a cutting board or preferably down into a large foil pan. Pull the slices apart one by one and drizzle honey down in there. You will want to hold the front so the slices do not fall all the way over and tear. Add more honey to the top of the ham and the flat or front area. 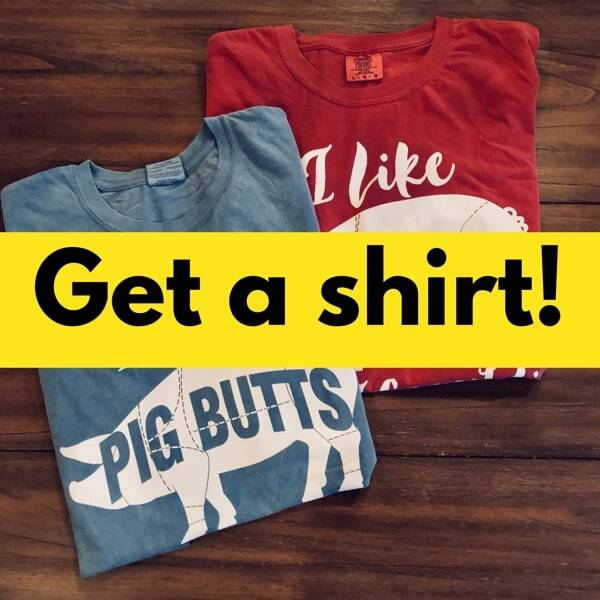 Spread it out with a brush or your hands. Pull back the slices once again and sprinkle a bit of rub down in between each one. Oh so good! Now apply rub all over the outside of the ham including the flat area in the front. To finish things off, drizzle more honey all over the top,sides and front of the ham. 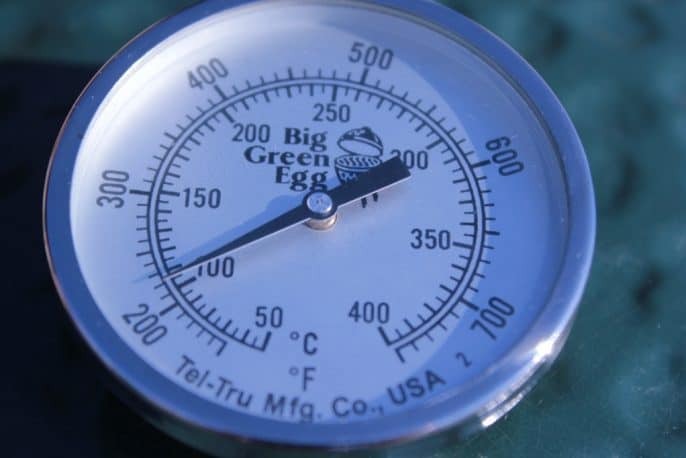 Set up your smoker for cooking at about 240°F using indirect heat. 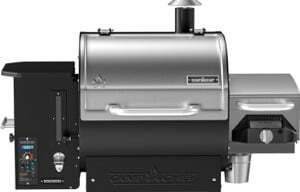 If your smoker has a water pan, fill it with hot water. We are going to apply light apple smoke for the full 3 hours that the ham is in the smoker. 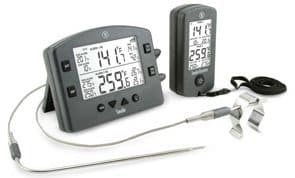 Most store bought hams do well if you smoke them at 230 to 240°F for about 3 hours. 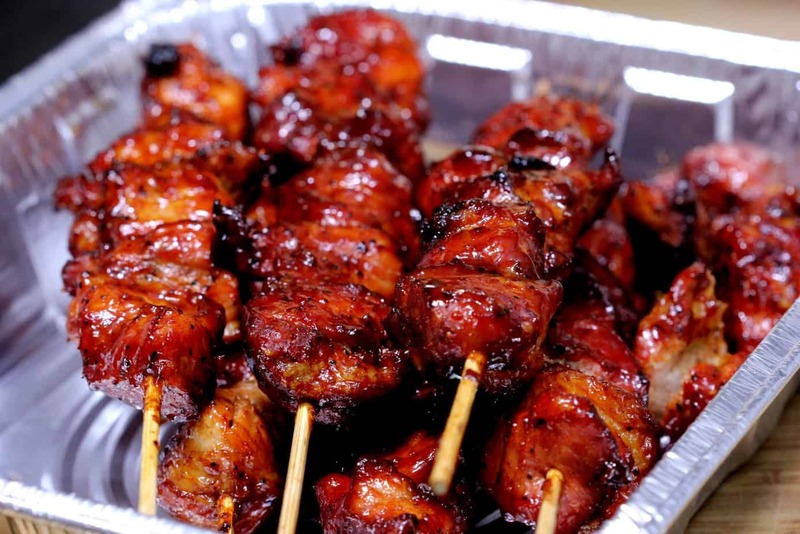 These are already cooked and the process is only to add more smoke flavor and to add seasoning and perhaps crisp up the outside here and there. If you want to smoke for less time, that is perfectly acceptable but results may vary. When the smoker is preheated, place the pan with the ham into the smoker. The pan will catch drippings and keep your smoker cleaner. 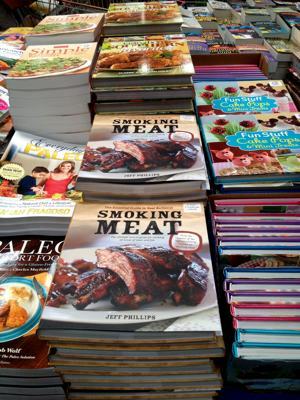 Note: Some smokers such as the Bradley advise strongly against using aluminum pans in their smokers. 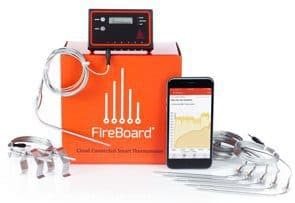 I recommend that you follow the manufacturers advice for the safety and well-being of your smoker. 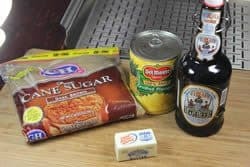 After about 2 hours, you can opt to make the pineapple/root beer glaze and pour it over the ham. This is optional but recommended. 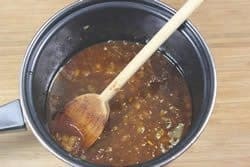 Add the ingredients into a sauce pan over medium-high heat. Bring to a boil and let it reduce for 6-8 minutes to thicken. When it's finished, gently pour it all over the top of the ham. See the toothpicks I mentioned earlier.. holding the front slices up? It works well and can be removed before serving. If you are quick, you won't lose much heat. 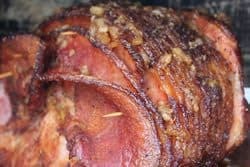 Remove the ham from the smoker about 15 minutes early, place it in a oven safe pan or dish and pour the pineapple/root beer glaze all over the top of the ham. Place into an oven preheated to 275°F for about 10 minutes. After 3 hours of smoking/cooking time, the ham is finished and can be removed from the smoker. Remove the ham from the pan onto a serving platter and call dinner. When the smoker is preheated, place the pan with the ham into the smoker. 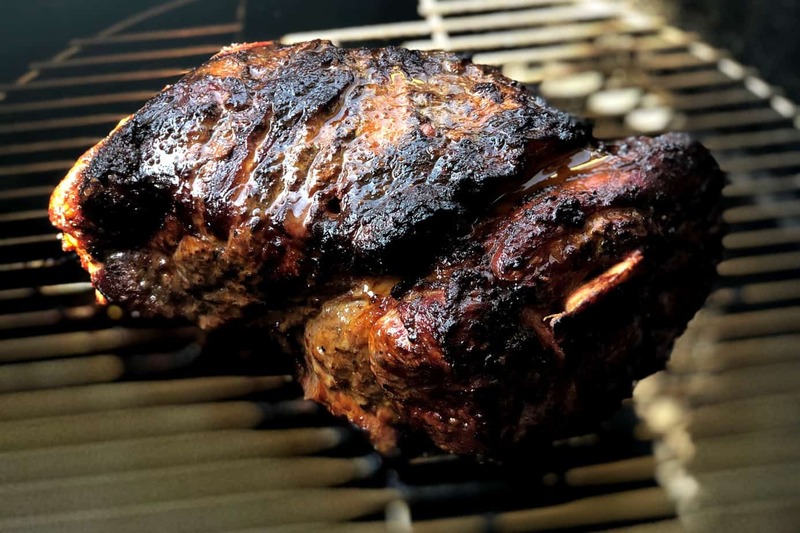 The pan will catch drippings and keep your smoker cleaner. 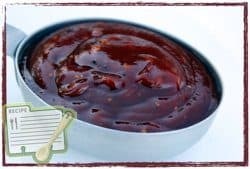 Make the glaze using 1 cup of root beer, ¼ cup of brown sugar, 1 TBS of butter, 2 TBS of Jeff's original rub and ½ cup crushed pineapple (undrained). Alternative glazing method if you did not use a pan in the smoker: Remove the ham from the smoker about 15 minutes early, place it in a oven safe pan or dish and pour the pineapple/root beer glaze all over the top of the ham. This turned a grocery store bought spiral sliced ham into one of the best hams we’ve had in a long time. In place of the root beer and pineapple glaze, we used the honey glaze spice pouch from the ham and mixed with some cola, honey and spiced rum (notes of cloves) and glazed the ham during the last 10 degrees of smoking. 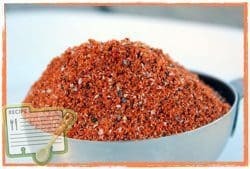 Complimented your original rub and all turned out wonderful. Second day use of ham slices with eggs and toast was a special treat. Thanks for your smoking ideas and weekly write-ups. Can I make this the day before and slice and leave in the juice and just reheat on Sunday before we eat? You can definitely do that if you need to. Just make sure to keep it covered with foil when you reheat and only reheat enough to bring it to a good eating temperature so as to not dry it out. We did two hams for Easter this year. 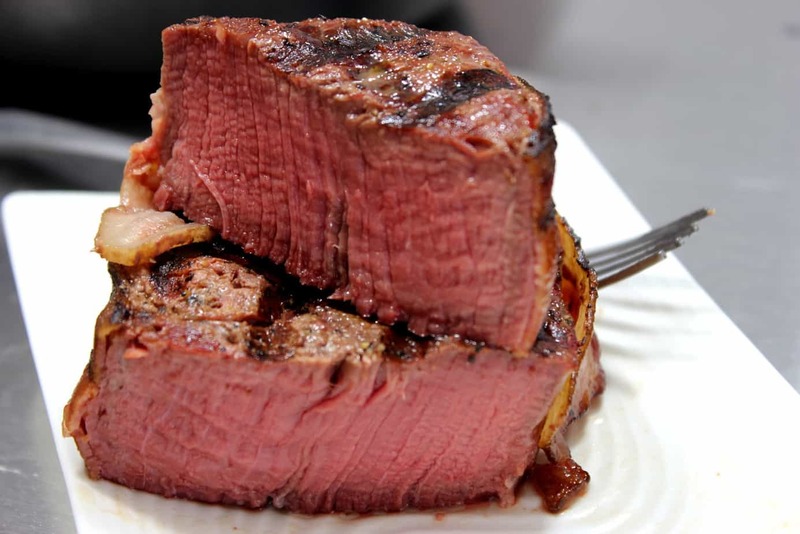 My wife put one in the crock pot, and I did the other on my Weber 22″ (with a Slow N Sear). Guess which ham everyone thought was better? Yup, the one I smoked. 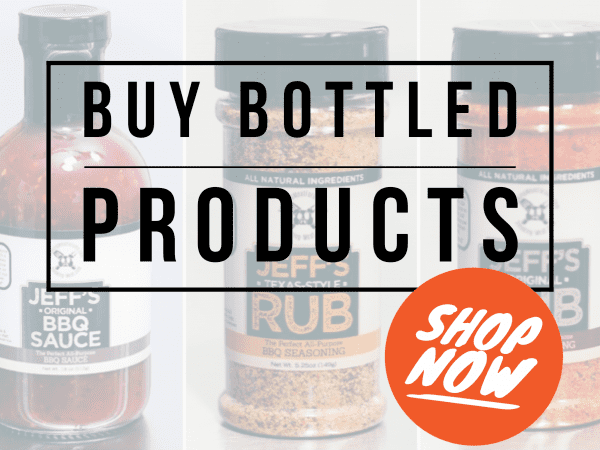 We modified the Jeff’s Naked rub by eliminating the salt and reducing the Cayenne by half. Next year I’ll smoke the ham again. Really good! 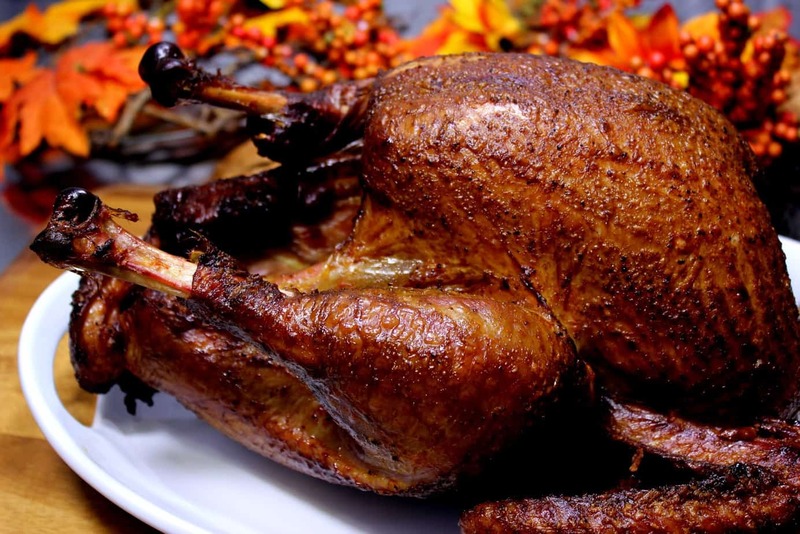 Jeff, I cooked this for Easter dinner and got nothing but rave reviews from the family, even when I asked them all to be honest. I prepared the ham the night before and put back into the fridge overnight. I noticed a lot of liquid in the bottom of the pan the next morning when I pulled it out to put into the smoker. Is this normal or did the rub sitting on the meat overnight pull the moisture out? The ham was plenty moist when it was served. Should I have poured this liquid out before putting it into the smoker? Just wanting to get your expert opinion before doing it again. OMG! Best ham ever. Pushing pork shoulder and brisket hard for best flavor! Thank you! The double smoked spiral cut ham is the best ham I have ever eaten . 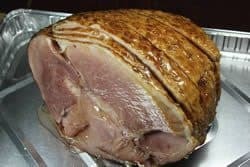 So many comments on how great the ham was and it was the best ham that most of my family has had. Thank you very much. 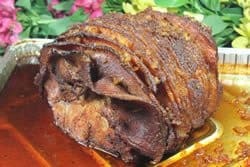 This ham was very easy and simple to do and mouth watering. You have not let me down on any of your recipes from your website or your book and your rub goes with everything I put it on. 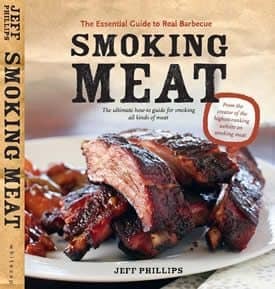 Again thank you very much jeff you make me look like a super hero around my smoker . 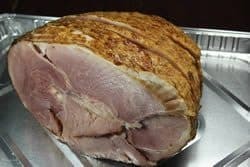 I smoked the double smoked ham for Easter dinner and it turned out great! Sweet, Juicy, wonderful.